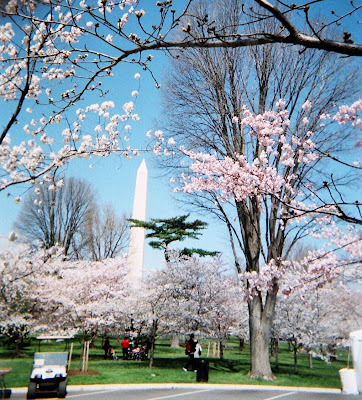 I was in Washington DC for the entire Cherry Blossom season and I didn't manage to make it down to check them out...tragic. In fact, I have to say that my life has been very uneventful. I've tried out some DC restaurants since moving to the area, signed up for a CSA and started a little veggie garden on my porch. In fact, I've gone a little patio garden crazy, having purchased about six different varieties of heirloom tomatoes. I hope to go back to blogging regularly in another week or two when all of my furniture and whatnot is finally down here (and I won't be sleeping on an air mattress anymore). I've been without regular computer acess and craft supplies for over two months now, I'm still not sure how I survived!